Now I get it. I couldn’t figure out why so many seem to favor government health insurance over private insurance but I was working on responding to a comment from a reader and suddenly it hit me. The comment was by Raj in response to my posting showing that the total profits of the big eight health insurance companies in 2008 comprised only 0.54% of our total health care cost. Raj said the problem must be in Sales General and Administrative (SG&A) Expense. What about that? Well, I took a look at one of the big companies, Aetna. They took in $27.3B in premiums and paid out $22.7B or 83% of the premiums in benefits. Of their total revenue of $30.95B, 15% went to G&A costs and about 4% to Sales costs. Profits were about 4.5%. All this is on a chart below. It’s not cheap to administer all those policies and claims and I doubt they are wasting much money in G&A costs because their motivation to reduce G&A in favor of profits is strong. The question on everybody’s mind is, ‘Why don’t they pay out more in benefits?” And then I suddenly realized why they are at such a disadvantage to the government. THEY HAVE TO HAVE A BALANCED BUDGET! Private companies cannot pay out more than they take in! Of course not all companies are successful in matching their income and outgo, but those that cannot usually have their stock prices driven down and go into bankruptcy or get acquired. I certainly wouldn’t want to have my insurance with one of those companies. The United States Government, on the other hand, suffers from no such pedestrian restraints on its financial activities. In 2008 the government took in $2.5T and spent almost $3.3T. (In 2015, the revenue was $3.453B and the expense was $4.023T.) And that can’t all be blamed on the war. 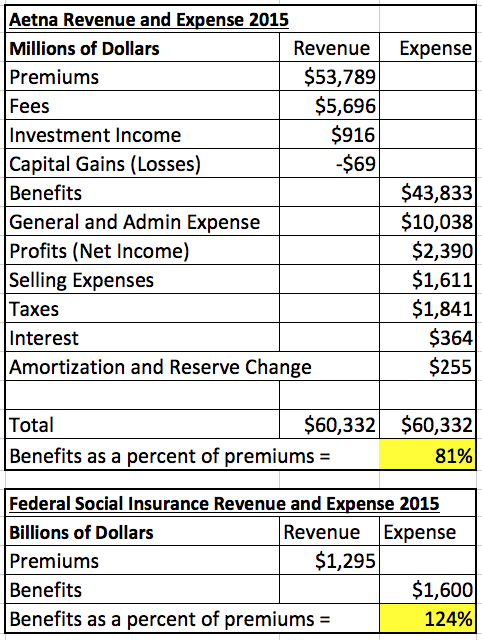 Just in the social insurance category, the federal government took in $975B and spent $1.4T. (2015 figures in the table below.) So, instead of being restrained to the measly 83% payout of Aetna, the government was able to pay out 144% (124% in 2015). No wonder so many people want the government run public option! The government is a financial wizard. The figures for 2015 are in the table below. If you are wondering about the validity of my numbers, check them out for yourself at the Bureau of Economic Affairs Website. You can see the 2008 Aetna Annual Report here. The US Government performs miracles with those tax revenues!